Very rare, highly collectible hand painted original three sheet movie poster of the cult Arnold Schwarzenegger hit, Predator (1987) for sale. 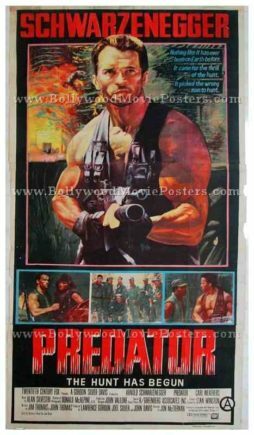 This is a very rare surviving original three sheet poster of Predator, which starred Arnold Schwarzenegger in the lead role. This three sheet movie poster measures a stunning 84″x38″ inches and was intended to be displayed inside a cinema foyer in India that actually screened Predator in the late 1980s! The only surviving poster of its kind, the poster has been designed using a combination of both hand painted techniques used along with photographic stills. No other known copies of this poster are known to exist in the world, making it truly one of a kind. Must have for serious collectors! Designed, printed and circulated in India somewhere in the late 1980s during the film’s release in India, this poster was originally intended for publicity inside a cinema hall but never ended up being used. Predator is a 1987 Hollywood science fiction action film that starred Arnold Schwarzenegger, Carl Weathers, Bill Duke and Jesse Ventura. The film has earned a cult following globally and has appeared on a number of top ranking lists. Owing to the phenomenal success of the film, two sequels have been made and a third is reportedly underway.